I was born and raised in southern France, and grew up with my mother, grandmother and all women in my family cooking every single meal from scratch. We ate three meals a day, with a little after-school snack called the quatre-heures (four o’clock) or goûter. The snack was usually simple: bread + butter + chocolate, or bread + cheese, or bread + saucisson (dried salami), or bread + butter + homemade jam, or croissant or pain au chocolat or a fruit, and water or home-made chocolate milk. We never had chips, pizzas or hot-dogs like I see here in the US. Every Saturday morning my parents went to the market to buy fresh fruits, vegetables, and meat. I loved to go with them; the vendors always gave me a little apple or Clementine to taste. When in season, we were eating French beans, peas, potatoes, zucchinis, tomatoes, plums, cherries, figs, and strawberries from my father’s garden. My mother canned most of it. It was so great to be eating French beans or peas during winter. As an adult, even when living and working in Paris, I continued my parents’ tradition of buying fresh ingredients at farmer’s market. Actually it was making me happy for the entire day! Then, when I moved with my husband to New York City it was time to discover a new country, a new language, a new urban city and a way of life … and experience so many new cuisines and flavors from all over the world. Every week we were searching into the Zagat guide for the best reviews of New York restaurants. We ate Japanse, Chinese, Italian, fusion, Vietnamese, Morrocan…. My palate was in heaven. During our stay in NYC I kept visiting the fantastic Union Square farmer’s market every week-end, and cooked simple dishes once in a while. Our life in New York City opened my palate toward new cuisines and flavors, and this is when I developed my love for ethnic and exotic food. Then we moved to Southern California in San Diego. When I got pregnant with twins (in my mid 30’s) eating organic, natural, healthy food was my goal and priority. I had a fantastic healthy pregnancy. Even born 4 weeks early each child was born a healthy weight, and we all went back home three days after they were born. As soon as my kids starting eating solid food, my husband and I started to create healthy, nutritious meals for our kids. As parents we were delighted to watch our kids gulped their sweet potato/chicken/ zucchini puree or their applesauce. Everything was organic and homemade. We used to shop at Whole Foods, Trader Joe’s or Henry’s market, and local farmers market. Then, we moved farther inland to a suburban community, and as a full-time working mother I hired nannies. With horror, I discovered they did not know how to cook and how to feed my children. I remember a nanny in her 30’s who never peeled a carrot before I asked her… It made me both mad and sad. Even a trip to the local grocery chain stores was painful–watching all these parents listening to their kids and having their cart full of junk, processed, frozen food, colored food. Eventually, my kids met other friends and kids at parks or birthday parties–and this is when my kids discovered the “other foods”: pretty, colored, processed, full of sugar or salt… Of course at that point my kids were asking for specific brand of cereals or cookies like their friends. So once or twice I listened but at the end they never ate it and we threw them away. Then it was time for them to start school: a new world of school cafeteria meals and lunchboxes. But even if at the beginning my kids wanted to eat at the school cafeteria to be “like” their friends, over time I noticed that they were asking less and less for it. As of today, I am happy to report that my children are still eating and loving healthy food in their lunchbox and during our home meals at home. My son eats religiously and daily his 5 fruits a day, my daughter wants to eat only healthy food, and never eat candies or store-bought cookies (she wants only homemade). I can imagine that most of you must be wondering: how this is possible? How in this era of fast food, junk food, and processed food can a family still cook and eat healthily? Like you, my life can be busy between my job, the house, errands, after-school activities, homework… and cooking. But I dedicate less than one hour per day to cook for my family. The leftovers are used for my kids’ lunchbox or as a base for another dinner. The key is to plan each meal in advance. 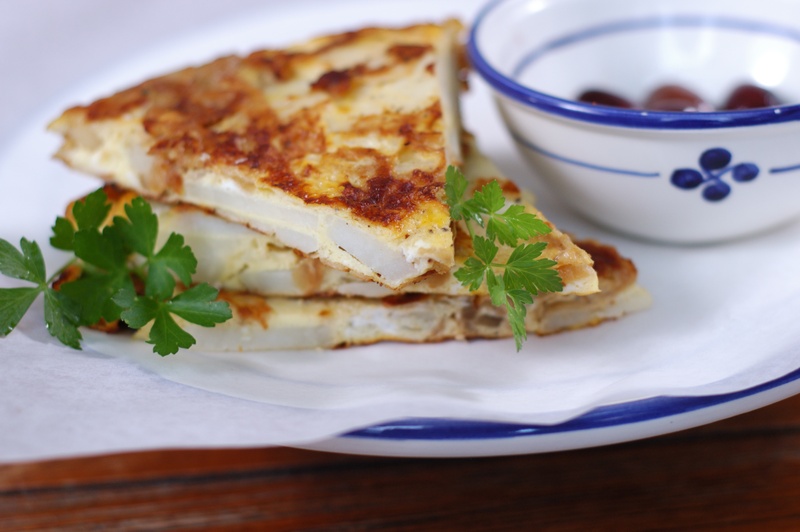 For example, when I make mashed potatoes, I cook extra ones and use them to make Spanish potato omelet for my kids ‘ lunch (see recipe below). I also use a journal and note what dishes my kids love and eat well. Then, when shopping, I buy only what I want my family to eat. In fact, I refuse to let my kids dictate what we need to buy or eat. So my fridge, pantry and freezer are always full of healthy food and ingredients. No other choices. Now that this is a routine and habit, they are happy with it, and me too. We eat a lot of homemade things made from scratch: pastas, cookies, bread, pizza and even Ricotta cheese! My kids love to help cooking. My daughter who is only seven yeas old is writing down her own recipes on recipe cards and making them. We eat three meals a day with a snack in the afternoon, and never “eat between meals.” When at home we eat at our kitchen table. My husband even created a “mix and match” game where kids answer question like: which is the capital of Japan, subtraction addition, multiplication, …so our meals are fun, and educational. I am also involved with the SHAPE program in Southern California, which is dedicated to helping children to be healthy and eat healthily. Last month I conducted a hands-on cooking class with 24 middle school students. They made apple crisp from scratch; it was such a lovely moment to see all them stirring and mixing things with smiles on their faces, and then their own creation. At the end they told me they did not know that cooking was so much fun and delicious! Here is one of our favorite family recipes: quick, easy, and delicious. I hope you enjoy it as much as we do. Recipe from Celine Cossou-Bordes Cookbook “Pack a Lunch ” (Cooking with Trader Joe’s cookbook series). 1. In a skillet, heat oil over medium heat. Add onion. Cook and stir onion for 5-8 minutes until soft and transparent. 2. Add potatoes and half the salt and pepper. Turn the heat on low. 3. In a bowl, beat the eggs with milk and the other half of salt and pepper. 4. Pour the egg mixture over the onions and potatoes. Move the pan a little to make sure that the egg covers all the potatoes. Without stirring, let the egg set for about 10 minutes, then turn off the heat. 5. Transfer the omelet onto a plate. Cover it with another plate and flip. Slide back into the pan and onto low heat. Cook for another 5-7 minutes or until the omelet is firm. 6. Transfer to plate. Cut in wedges when cool. Serve warm, cold or at room temperature. Celine Cossou-Bordes is a cooking instructor, a Certified Nutrition and Wellness Consultant, a small event caterer, a food blogger (www.celinescuisine.com) and the author of the brand new “Cooking with Trader Joe’s Cookbook: Pack A Lunch!” (http://www.cookTJ.com/cookbooks) which was released in August 2011. It’s full of portable delicious lunch ideas for adults and kids, all using ingredients from Trader Joe’s. « Yummy French School lunches…What pre-schoolers are eating this week in Versailles!